Francesca Martinez will talk to those of us who are interested in an inclusive approach to health about the beauty of diversity. Students studying the social determinants of health and interested in the challenges of the social divide are particularly welcome to consider Francesca's valuable perspective. Francesca will be on stage at the Great Hall 12 noon to 12.50 as part of the School of Health Sciences teaching programme about healthy communities. 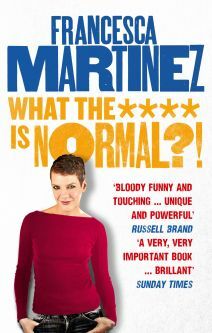 She will then stay for a little longer for a book signing of her recent publication: What the **** is Normal?! All of you who are interested in thinking about social inclusion and health are welcome to come to this event which is funded by the School of Health Sciences at City University and free for you to attend. Francesca Martinez (born 1978) is a stand-up comedian, writer and actress, born in London. She has cerebral palsy but prefers to describe herself as "wobbly". She has had many sell-out shows at the Edinburgh Festival and internationally, including the Melbourne Comedy Festival, the Adelaide Fringe Festival, the Perth Festival, and the Just For Laughs Festival in Montreal. In 2014 she completed a 68-date UK/Ireland tour and has had multiple off-West End London runs at the Tricycle Theatre, the Hackney Empire, and the Soho Theatre. On 8 December 2012 Martinez launched a campaign War on Welfare which pledged to sign 100,000 supporters for a petition calling for an end to government cuts for disability benefits and an independent impact assessment of the government's welfare changes. The petition attracted 5,000 signatures in the first 48 hours, and achieved its target of 100,000 supporters on 30 November 2013. In 2014, her best-selling book 'WHAT THE **** IS NORMAL?! was published by Random House to critical acclaim. It has been nominated for the Chortle Comedy 'Best Book' Award and The Bread And Roses Radical Publishing Award.